Let’s face it, Las Vegas is all about luck. If one vacations out in the desert, that person could win $1 million, or perhaps lose some money at one of the many casinos on Las Vegas Boulevard. Kevin Harvick, driver of the No. 4 Jimmy John’s Ford Mustang for Stewart-Haas Racing, knows about Vegas luck. Just look back on his 2018 visits to Las Vegas Motor Speedway. In the spring race, after starting second, he dominated by leading 214 of 267 laps and won by 2.906 seconds over second-place Kyle Busch. Some would say he was freaky fast. 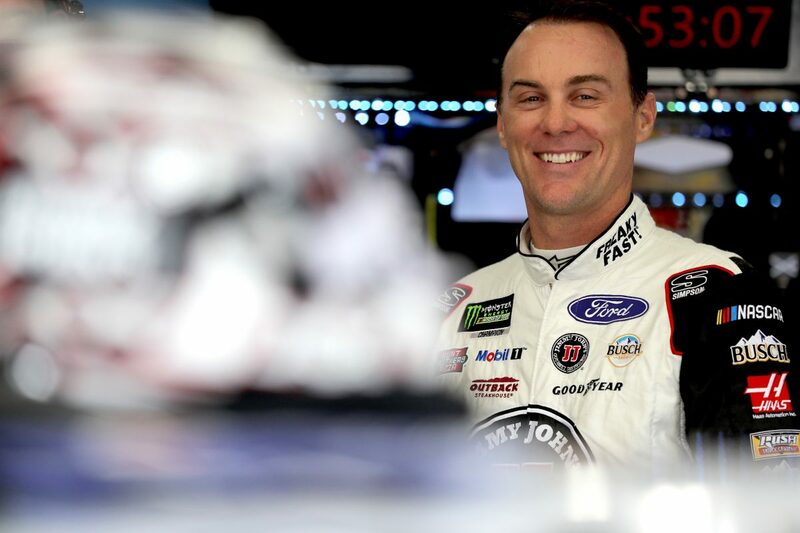 But in the fall race, Harvick started fifth and led 14 laps before cutting a tire, leading to contact with the turn-one wall and a disappointing 39th-place finish. One day people can have all the luck and, the next day, none. That’s the story of Las Vegas. Harvick will again play with a different set of rules in Sunday’s Las Vegas 400. For last week’s race at Atlanta, NASCAR officials introduced a new rules package announced last October. The new and different packages are tailored to the specific tracks on the Cup Series circuit, with a combination of a smaller tapered spacer to reduce engine horsepower to a target goal of 550 – from 750 – and aero ducts to foster tighter racing on a majority of speedways measuring longer than 1 mile. Both features are in place for 17 of the 36 races, the lone exception being the Daytona 500, which ran with traditional restrictor-plate rules. Atlanta, along with four other races, were set to run with the smaller spacer, but without ducts. Las Vegas will be the first true test of the entire new rules package, including the ducts. So, will Harvick be able to lead 214 laps again? Who knows? But he’s has been strong at the 1.5-mile oval. The Las Vegas 400 will mark Harvick’s 20th career Cup Series start at Las Vegas. He won in 2015 in addition to last spring’s victory, and he has five top-five finishes and eight top-10s there with 452 laps led. He’s also competed in NASCAR Xfinity and Gander Outdoors Truck Series races there, as well. In 11 Xfinity Series starts at Las Vegas, Harvick has two wins, one pole, six top-five finishes, seven top-10s and he’s led 364 laps. Harvick’s first Xfinity Series win at Las Vegas came in 2004, when he started 11th and led 14 laps, and his second in 2010, when he started second and led 82 laps. His lone Xfinity Series pole position came in 2007, when he ran 181.111 mph. In his three Truck Series starts at Las Vegas in 1997, 1998 and 1999, Harvick has an eighth-place finish in 1997 and ninth in 1999. No one really knows what is going to happen at Las Vegas with the new rules package this weekend, but that’s fitting for the city. One thing for certain, however, is that the winner will need a little luck. You were in the broadcast booth last week for the Xfinity Series race at Atlanta and are again this week in Las Vegas. How do you prepare for the broadcasts? You had Jimmie Johnson on your radio show last week. How was that interview?